Olaparib, a PARP inhibitor, may be come standard follow up therapy for newly diagnosed with ovarian cancer that carries a mutation in the genes BRCA1 or BRCA2. An international study showed a 70 percent reduced risk of death or disease progression in the olaparib group compared to the placebo group, as well as improved median progression-free survival. Based on the results, olaparib was approved by the FDA in December 2018 as “maintenance therapy” for women with newly diagnosed advanced ovarian cancer that tests positive for a BRCA mutation and whose cancers have responded to their initial platinum-based chemotherapy. On the strength of the results of a major international clinical trial, there is now a new standard of care for patients with an advanced form of ovarian cancer who have responded to initial chemotherapy. The trial, dubbed SOLO-1, found that these patients – newly diagnosed with ovarian cancer that carries a mutation in the genes BRCA1 or BRCA2 – had a 70 percent lower risk of dying or having their disease worsen if they received the drug olaparib rather than a placebo after completing their chemotherapy. Olaparib (trade name: Lynparza) is a PARP inhibitor, which works by interfering with cancer cells’ ability to repair damage to their DNA. In tumor cells whose ability to repair DNA damage is already impaired because of BRCA mutations, olaparib can cause so much genomic damage to build up that the cells self-destruct. The trial, led by investigators in the United States and on three continents, involved 391 patients who were newly diagnosed with advanced high-grade serous or endometrioid ovarian cancer, primary peritoneal cancer, or fallopian-tube cancer that tested positive for a BRCA mutation and had shrunk after treatment with surgery and platinum-based chemotherapy. Two hundred sixty of the participants were randomly assigned to receive olaparib and 131 received a placebo. After a median period of 41 months, not only was the risk of death or disease progression 70 percent lower in the olaparib group, but also researchers estimate that median progression-free survival – the time in which patients are alive without the disease worsening – was approximately three years longer in the olaparib group. 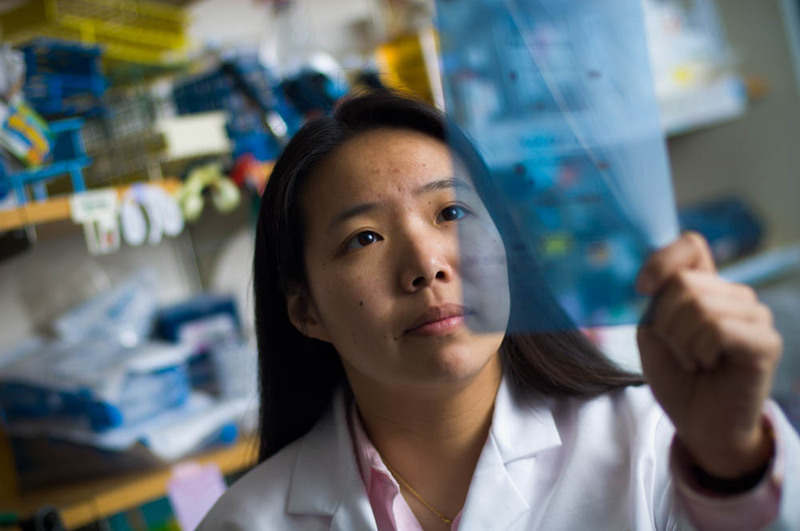 “This is a major and exciting advance,” says Joyce Liu, MD, MPH, director of Clinical Research in the Division of Gynecologic Oncology at Dana-Farber. The most common adverse side effects of the treatment were nausea, fatigue, vomiting, anemia, and diarrhea. Results of the trial were announced this fall at the European Society for Medical Oncology 2018 Congress in Munich and in a paper in the New England Journal of Medicine. Olaparib has previously received U.S. Food and Drug Administration (FDA) approval as a “maintenance” therapy – used to prevent a worsening or recurrence of cancer following front-line treatment – for patients with recurrent epithelial ovarian, fallopian tube, or primary peritoneal cancer who respond to platinum-based chemotherapy regardless of whether the cancer tests BRCA-positive or -negative. Based on the results of SOLO-1, olaparib was approved by the FDA in December 2018 as “maintenance therapy” for women with newly diagnosed advanced ovarian cancer that tests positive for a BRCA mutation and whose cancers have responded to their initial platinum-based chemotherapy. “This is a major and exciting advance in our treatment of BRCA-related ovarian cancer. Upcoming trials should provide additional insight into whether PARP inhibitors, either by themselves or in combination with other therapies, can also benefit women whose ovarian cancers do not have a BRCA mutation,” says Joyce Liu, MD, MPH, director of Clinical Research in the Division of Gynecologic Oncology at Dana-Farber and a co-author of the New England Journal paper. Wonderful to see the great results in the SOLO-1 trial. I am a 31 year survivor of the IIIc epithelial serous ovarian cancer. I have the BRCA2 mutation. I have been taking the Parb Inhibitor Zejula for 1-1/2 years. I think it is similar to Lynparza. Zejula has worked well for the BRCA 1 Serous Uterine Cancer. Within the last 8 months I had to stop taking it due to intestional & rectal issues so both the CA125 & tumor size increased. When I restart the Zejula I am hoping the Zejula works as well as before. I feel it’s a miracle drug! I would not not be alive if I didn’t take it! This is great news for BRCA+ patients. I’d love to hear what Dr. Matulonis thinks. Unfortunately, I do not have a BRCA mutation…or any of the 5 that are known specific to OC (I have high grade serous). Keep researching, please. I have survived for just over 2 years, but am now recurred, and heading for a 3rd line of treatment…and am having grave difficulty qualifying for a trial due to my history of UC….despite the fact that I was “cured” with surgery! Won’t someone take a chance that my immune system might just be the missing link in your research re: how the immune system works ? Thank you.